The pilot project “New office building” is located in Essen, Ruhr-area in Germany, directly on the UNESCO world heritage site of “Zeche Zollverein”, a former coal mine industrial complex, visited by over 1,5 million people per year. The demolition of pre-existing structures has already taken place before 2015 the project was set up, and the client has taken over the site as a prepared brown field. 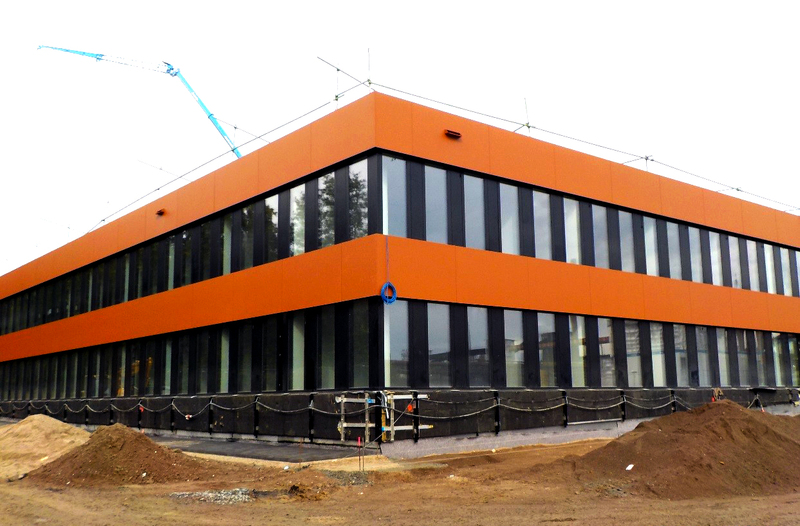 The new office building will host over 200 high quality office work places for the RAG Group. The total gross floor area will be approx. 10,000 m², with a total gross volume of approx. 39,000 m³. The project is intended to be a pilot for sustainable design with a special focus on the Cradle to Cradle design principles focusing on transformable and recyclable design, healthy materials and the use of a “Material Passports”. Also, parts of the building are planned to be accessible for public (e.g. the rooftop garden of approximately 3000 m²). The project is now in the completion phase and will be finished soon. Photo: Part of the New Office Building. In order to fulfil the requirements this sustainability approach entails, an essential task was to find or develop a tool that enables a very detailed acquisition and documentation of all the materials integrated in the building. This allows auditing the construction in terms of material health, environmental impact adaptability and recyclability, even during the planning and design process. At the same time, it provides all the information needed when the building shall be modified and adjusted to different purposes or finally deconstructed while generating a minimum amount of waste. Utilizing buildings as material banks and thus recycling them either completely or parts of them in high quality applications again and again is considerably simplified by compiling a comprehensive documentary of the components used in them during construction. 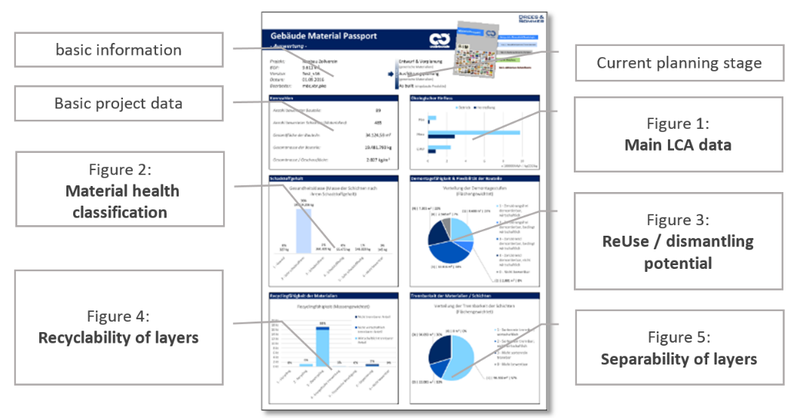 The “Buildings’ Materials Passport” had been developed as a concept for a tool fulfilling all these requirements and subsequently was to be applied under the realistic background of a project development scenario on the German market. 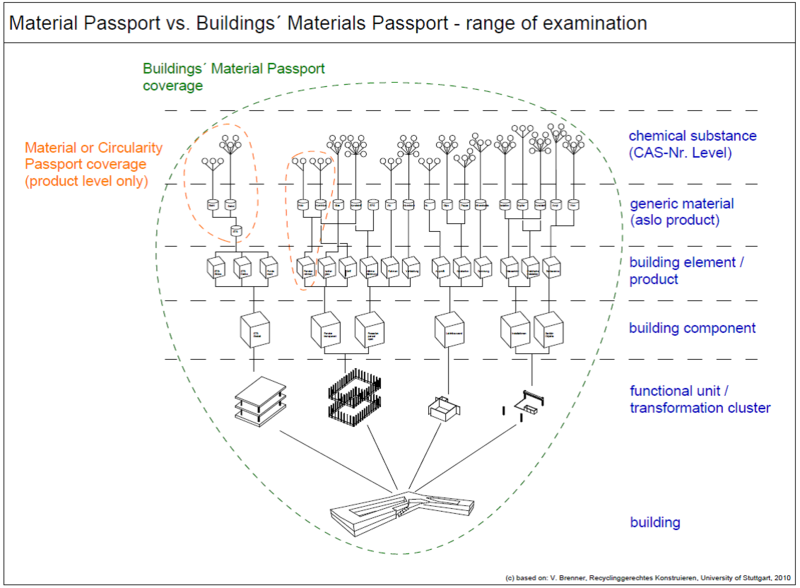 The illustration explains the project-specific understanding of the “Materials Passport”. As it applies to this building, the “Materials Passport” refers not only individual construction products or building materials, but rather to the entire structure of the building at all levels. It can therefore be understood as a “Buildings’ Materials Passport” (BMP) that covers the whole building which is greater than the maximum data depth for individual products. To transform the BMP concept into reality and make it usable for planners and consulters in this and in future projects without significantly delaying the planning and design process, a powerful instrument was required. 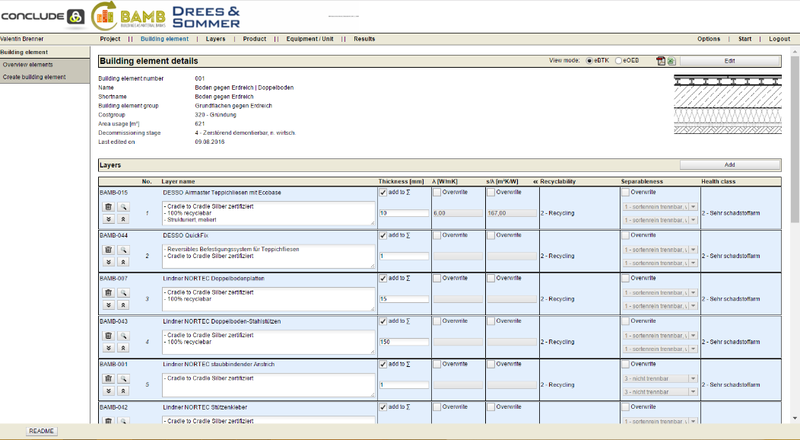 The screenshot below shows the desktop of the online tool. The user interface displays the entrance-defined planes of the building (building/project, element/component, layer/generic material/unit, specific product). An essential component of the BMP for communicating with the builder and the stakeholders is the clear assessment and presentation of the status quo of the project. This was made possible by the creation of a one-page evaluation sheet, clearly displaying the key parameters. The evaluation sheet can be updated at regular intervals during the planning and construction process and facilitates effective communication with the builders and clients. By implementing the material passport and recyclable design aspects within the project it will be possible to divert 4641 tons of waste from landfills, 91 tons of waste will not have to be disposed thermally and an additional 12108 tons of material can be recycled into products of equal quality. The pilot project was therefore successful in implementing and testing key aspects of the research project Buildings As Material Banks within a realistic market environment. With the possibility to present “powerful evidence” that is able to withstand strict economic requirements, hopefully it is now possible to recruit other builders for projects with similar ambitions with respect to building as a warehouse of raw material.